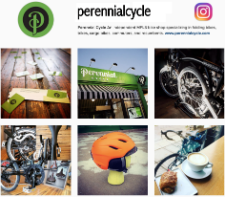 Perennial Cycle sells more dynamo hubs, lights, chargers, wiring kits, wheels, connectors, mounts and all other things related to dynamo lighting than any other bike shop in the US! The reason is very simple: we absolutely love and believe in dynamo lighting as a true game changer when it comes to seeing and being seen on the roads. No wondering if you have them in your bag or if the batteries are charged or if you remembered to remove them from your bike the last time you used them. You can be confident that your lights are working. If you are unfamiliar with what dynamo lighting is, check out our blogpost about it HERE. Most of our dynamo customers are commuters, touring cyclists, bike campers, randonneurs and the big mileage gravel racers. Commuters are all about the lights, cycling tourists are most interested in getting setup to charge their phone and less concerned about the lights and the big mileage rando and gravel riders are in need of both the charging and the lighting. 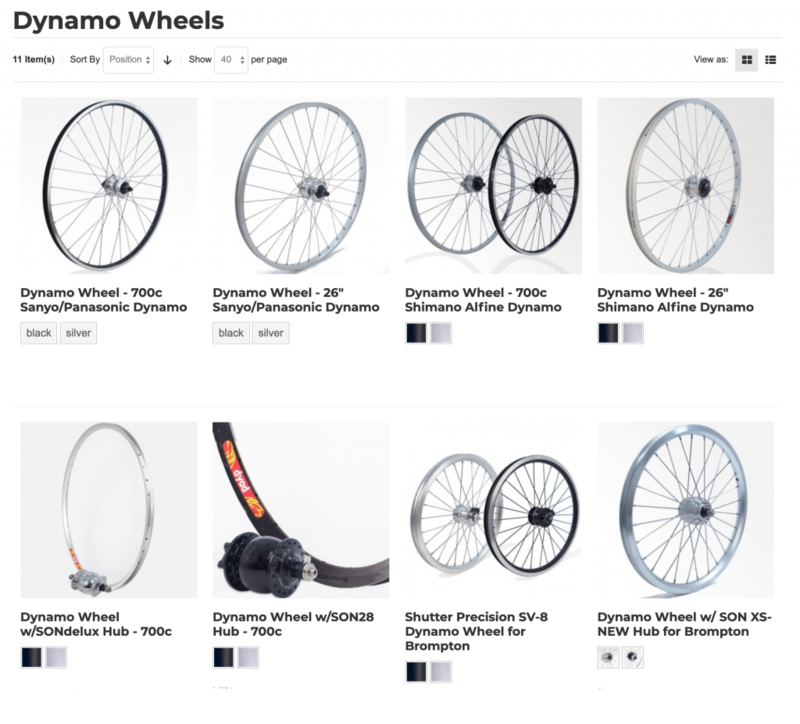 The dynamo wheels on our website have options (options show up after choosing your color) for both front and rear lights (and in some cases special wire kits) that make it possible for you to see exactly what the cost would be to setup a complete dynamo kit with a front and rear light. This can be a great tool if you are new to dynamo and need the full kit or if you're simply trying to work out budget. 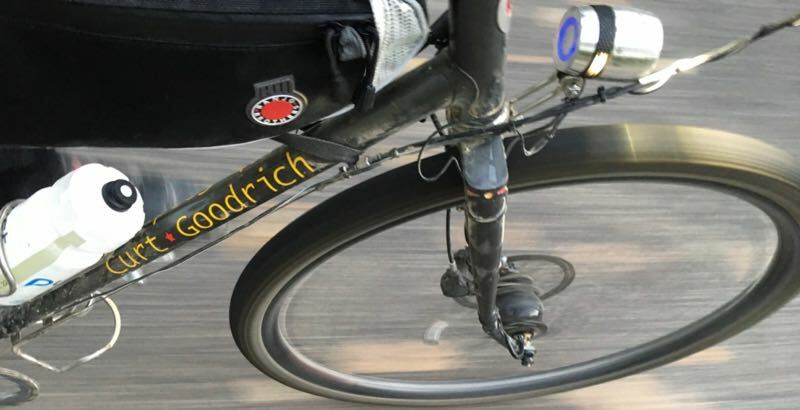 We used to start off with a wheel and front light, but the reality is, dynamo rear lights are inexpensive and the wiring is not problematic, so it's best to just go for it! Brompton folding bikes are ideal candidates for dynamo lighting. These bikes are very utilitarian and thus end up being ridden at night with regularity. Brompton understand this and offers a dynamo kit that is a great price, though lacking in brightness. Lots of people get custom kits or have us upgrade their current lights. We have tons of experience setting up all bikes with dynamo lighting kits. Also we work hard to keep a great selection of dynamo parts and accessories in stock. Our dynamo hubs and lights are almost exclusively from German companies because Germany has a lot of cyclists and very strict laws regarding riding a bike at night (as in you can't ride at night if you don't have self generated lights). Because of these rules, there is a much stronger market in Germany, so naturally their dynamo companies rule the world market. We consider ourselves lucky in regards to this German dynamo monopoly. 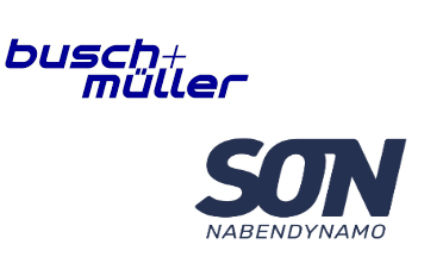 Busch & Müller and SON Nabendynamo are developing absolutely phenomenal product. Dynamo hubs can be used to charge devices. In this picture you can see that I use a SON Deluxe front hub and The Plug III to change my phone that is tucked inside the Banjo Brothers Frame Bag. We have a blogpost dedicated to using dynamo hub power to charge devices as it can be a challenging to get a good understanding. Check out that Blogpost HERE. This is our dynamo demo bike built by a past employee that built amazing bikes in the basement (thanks Matt!). The hub is a SON Deluxe that Matt fit a singlespeed freewheel onto (using disc brake rotor mounts). Sometimes we use it to troubleshoot issues, but mostly it's used to show how little resistance there is when you are using dynamo hubs. Our dynamo demonstrator allows you to spin the wheel with the lights off, and then with lights on, making it very easy to compare. Each front light has a different rear light connected to it. Currently the front lights on the demo bike are the Schmidt Edelux, Busch & Müller IQ-X, Lumotec IQ Cyo T Senso Plus Premium and IQ Lumotec Avy N Plus. The rear lights are the Busch & Müller Toplight Line Small, Secula Plus (fender and chainstay mount), Toplight Line Plus. 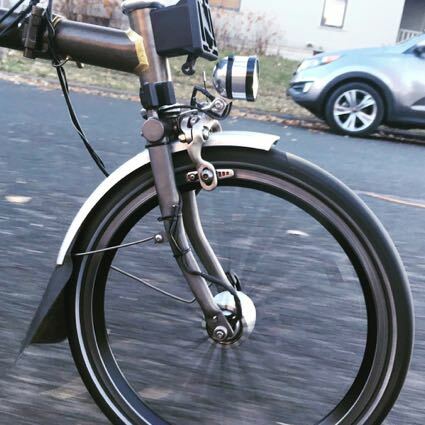 This entry was posted in Miscellaneous, General, Product Showcase and tagged Dynamo Lighting, Dynamo Wheel, Dynamo Minneapolis, SON Nabendynamo, SON Hubs Minneapolis, Dynamo USB Charging, Best dynamo Light, IQ-X Dynamo Light on March 20, 2019 by Luke. Servicing bikes is taken very seriously at Perennial Cycle. Brompton Bikes are a big part of our service department. It's only natural that we would offer the best chains that you can install on your Brompton Folding Bike to make it shift quickly and run smoothly. While the stock (OEM) chain is functional in a gets-the-job-done kind of way, the chain is the heart of your bike's transmission and thus a great component to upgrade to help you get the most out of your bike. 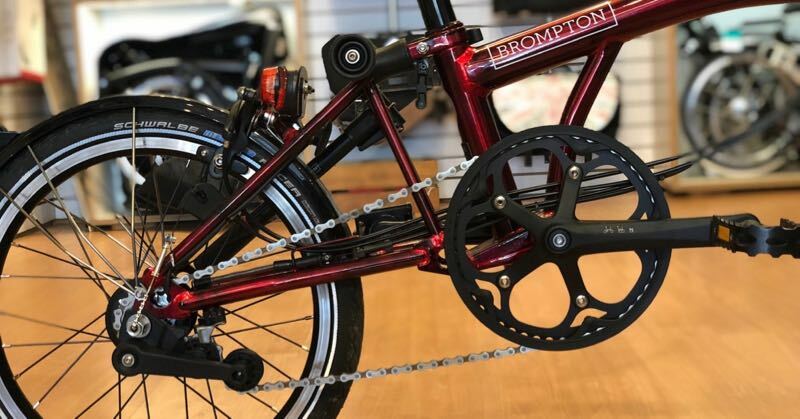 Being that the Brompton chain is a basic OEM chain, we feel pretty strongly that it doesn't match the quality of your amazing Brompton Folding Bicycle. The Connex 8sX is the best. Hands down. Manufactured in Germany using the best tech available. The stainless steel plates with nickel inner links make this a weather-proof chain that is highly wear resistant. Expect an extra 40% life from the 8sX as well as improved shifting. The included Connex Link is known to be the most dependable quick link available. 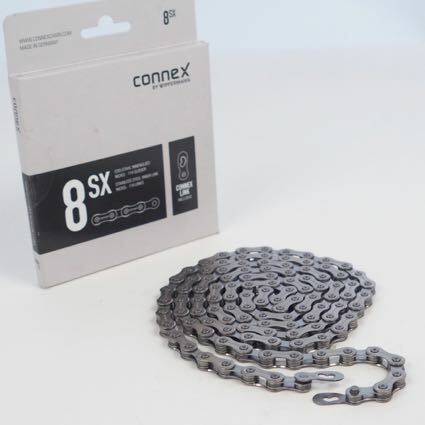 This is not an inexpensive chain, but it is a great value. 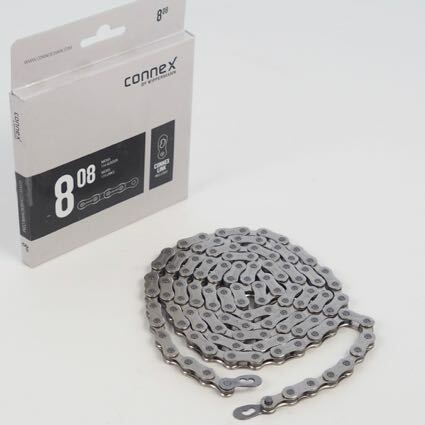 The Connex 808 is a full nickel chain (both inner and outer plates). It can handle the weather better than most chains on the market. Also the chain plate design is the same as the 8sX, so shifting will be smooth and quick. The Connex Link (included) is legendary for being extremely dependable. Though the 808 is not manufactured in Germany, it is quality tested prior to packaging in Hagen, Germany. 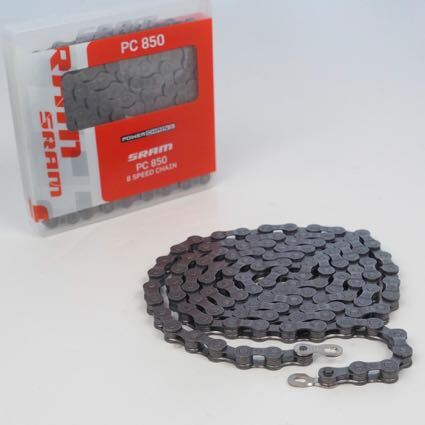 The SRAM PC 850 is the best chain that you can buy for under $20. Uses SRAM's Powerchain II technology and comes with a SRAM Powerlink for tool-less installation. A clear step up from the Brompton OEM chain, yet keeping things very economic. The length of the chain is determined by the gearing on your bike. 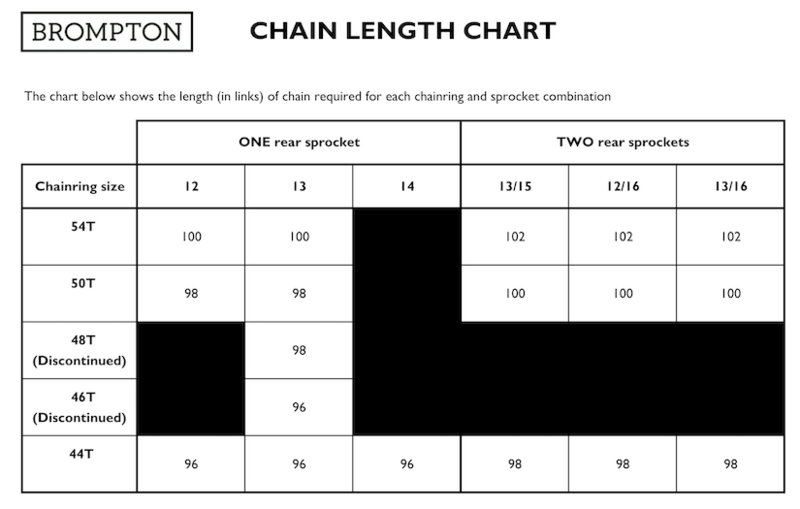 The chart below is what we use to get the chain length correct for each Brompton we're working on. If you buy a chain and you choose the number of links you want it to be, we'll measure it and send you the chain as requested along with the quick link. This way you would not need a chain tool on your end. BTW: If you are going on a trip or tour, having a spare connecting link could end up saving the day. Find the connecting links with the chains. Extra Details: If your chain needs replacing, we'd expect you to also need to replace the sprocket(s) on the rear wheel. These are available HERE. Replacing your chain and sprockets is a simple way to keep your shifting smooth and your drivetrain running quietly. Extra Extra Details: Older Bromptons used 1/8" chains, instead of the current 3/32". We don't expect to put any 1/8" chains on Bromptons. The current sprockets available are for 3/32" chains, so if you currently have an 1/8" chain, we'd be replacing the chain and sprocket with 3/32" sprocket and 3/32" chain. 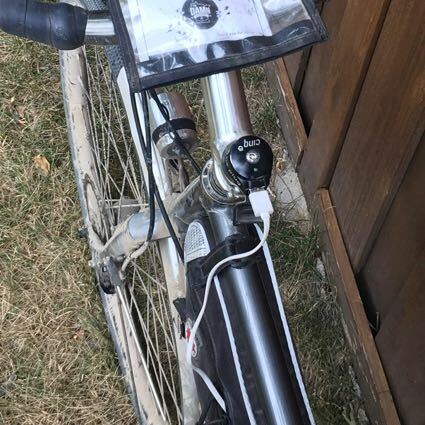 This entry was posted in Miscellaneous, Product Showcase, Repair Highlight, Instructional, Service and tagged Brompton Chain, 9022038, QCHAIN098DR, 9022045, QCHAIN100DR, 9022076, QCHAIN102DR, 9022106, QCHAIN096DR, 9022052, QCHAIN100DR-50, 9022083, QCHAIN102DR-50, 9022137, QCHAINPL-26, Best chains for Brompton, Chain length Brompton, chain upgrade Brompton on March 4, 2019 by Luke. I have been a fan of cycling bags for as long as I've been into bikes. A bike shifts from a toy to a tool as soon as you fit a bag to it. High quality bags that are feature rich are common and we stock a massive assortment at Perennial Cycle. Mind you, B&W's B3 is not like any of the other bags in the shop. 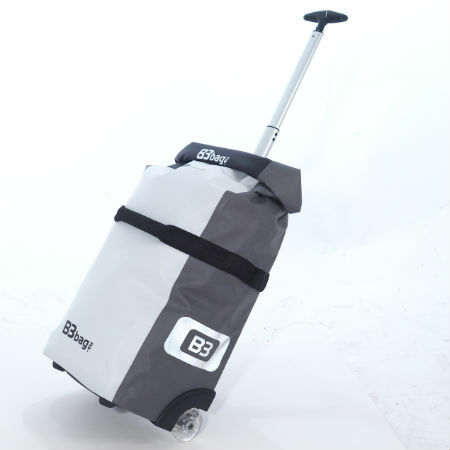 A bike bag with pannier hooks AND a handle, rollerblade wheels and the ability to roll around like a suitcase... amazing! B&W is a German manufacturer of cases for taking bikes, wheels, toolkits, etc all over the world. 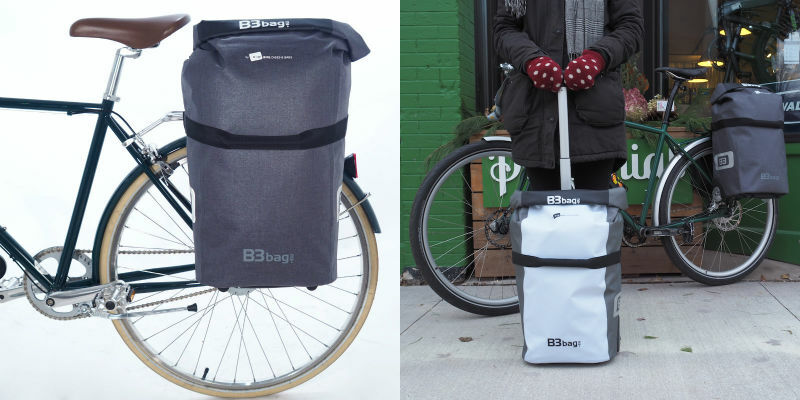 The B3 is their first bag designed to mount onto a bike and they transferred designs of their amazing cases for flight right into the B3 Bike Pannier. The pannier hooks are compatible with rather massive range of rack tubing diameters (1/4" - 5/8"). Using the pannier hook adjustment lock you can custom fit the hook to your rack. This way the bag won't end up rattling on the rack. 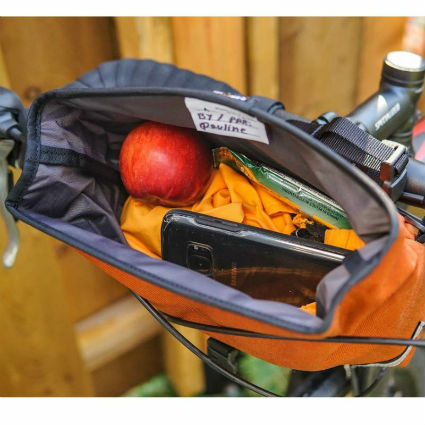 While the pannier hooks snap on the rack tightly, there's also a nifty locking hook that you can flip to prevent the bag from launching no matter what your riding style. This bag has a lot of nice features (beyond the rollers w/handle). - The rubberized fabric with nylon interior is 100% WATERPROOF. 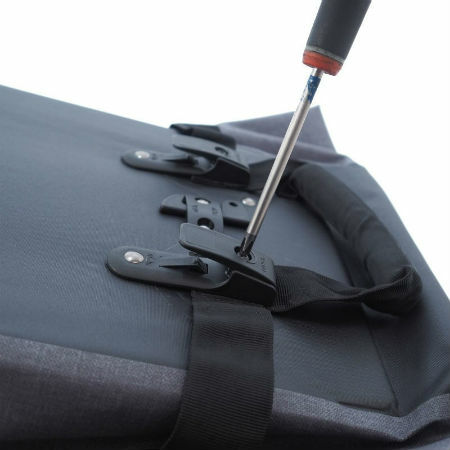 - The rolltop design makes sure that no water will get in, no matter hard the rain is coming down. - The compression strap helps keep your items from shifting, even when there's not a lot in the bag. - Reflective lettering on the back as well as on the side of the bag improve visibility at night. - Over 2,000 cu.in. of capacity (and if you really want to fill it up, you can open up the rolltop and get nearly 3,000 cu.in. in! Stop by the shop and see how it fits on your bike. I'm pretty confident that you'll like it (a lot!). It is definitely designed to carry a lot, yet not break your back getting it into your office. It's also clear that is designed and manufactured to last for years of regular use. This entry was posted in Miscellaneous, Product Showcase, Bags! Bags! Bags! and tagged Waterproof Pannier, B3 Rolling Pannier, 96400B3 Bag Gray, 96400B3 Bag White, 96400/white, 96400/gray, Big Bike Bag on March 2, 2019 by Bri L.
Arkel has been designing and hand crafting bike bags in Canada for over 20 years. ALL of their bags are built to last tens of thousands of miles of use. Arkel has been a favorite brand here at Perennial Cycle for over 15 years. The Signature Series is an example of why we love their product. 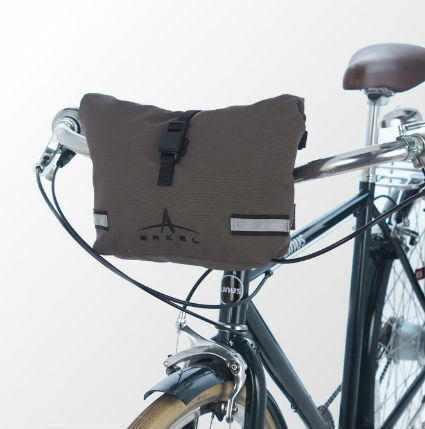 Arkel’s newest addition to their Signature Series, the BB Handlebar Bag, offers cyclists a compelling option for those looking to ride with just the essentials. Made with high-quality 1000 denier Cordura, waterproof liner and fully taped seams, the BB Handlebar Bag is ready for any adventure you can throw at it. At 4 L (244 cu in), the BB Handlebar Bag can carry anything from compact cameras and windbreakers to wallets, mini U Locks, battery packs and snacks for the road. Here at Perennial Cycle we’ve been experimenting with this bag’s potential as a Brompton Handlebar bag. We've found it to be an nice match even when folded! Paired up with a Fidlock Magnetic closure, this bag makes packing and unpacking a breeze. 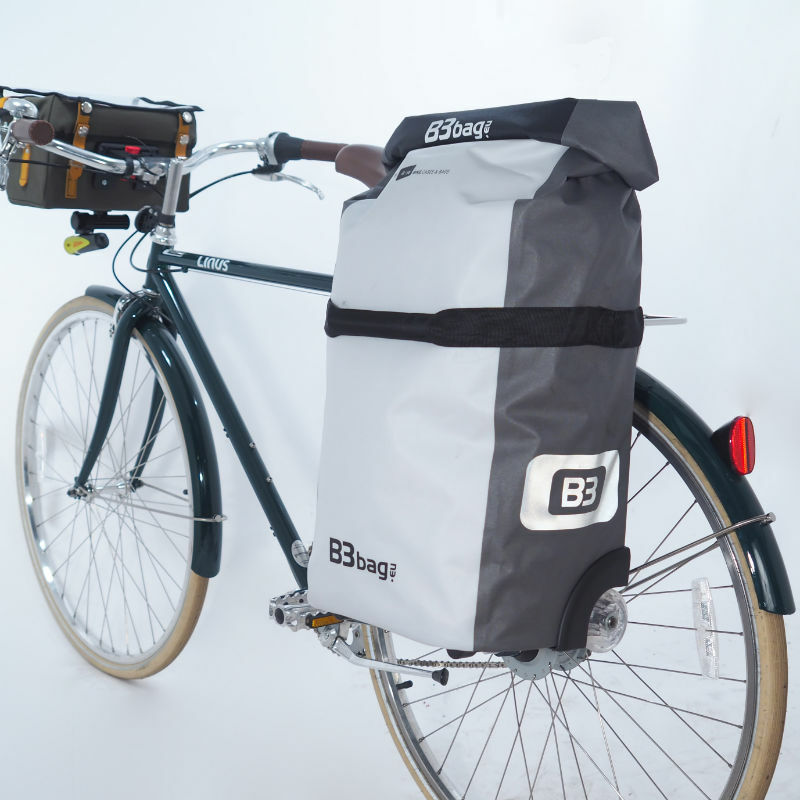 The BB Handlebar Bag comes equipped with velcro loops on the bag for easy attachment (which also makes for easy transfers between bikes) as well as a removable shoulder strap for transitioning from the saddle to the cafe! 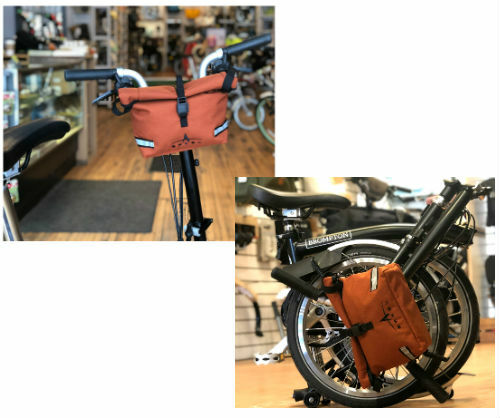 The BB Handlebar Bag comes in the classic Arkel colors (black, olive, and copper) which blend in perfectly with Arkel’s other entries in the Signature Series. This entry was posted in Miscellaneous, Product Showcase, Bags! Bags! Bags! and tagged BB Handlebar Bag, Bicycle Handlebar Bag, Canadian Bike Bags, arkel sigbbbk, arkel sigbbc, arkel sigbbo on February 28, 2019 by Luke.